SCCTC welding students (top, from left) Jake Peters, Jason Salmini, Markus Newberry were among about a half dozen youths to participate in the construction of the new plunger lift training unit to be employed by Cabot Oil and Gas. 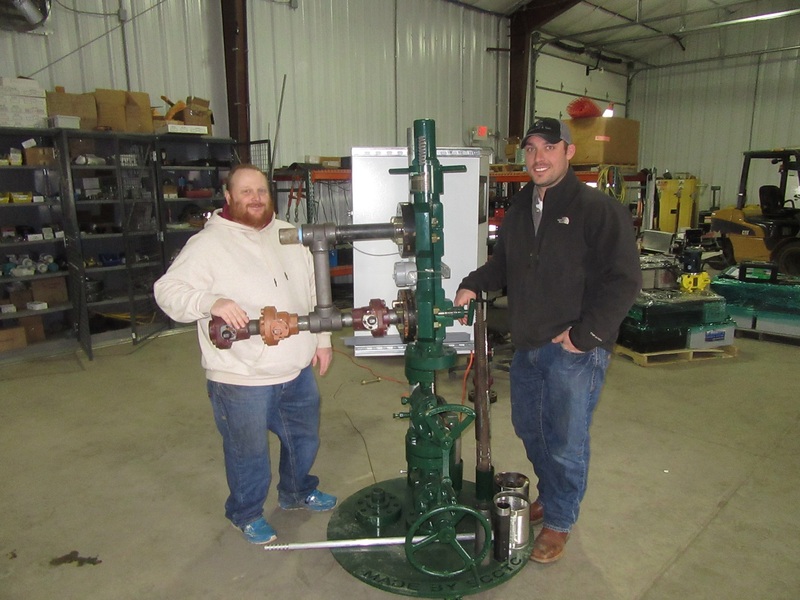 Cabot employees Ryan Bennett (above, left) and Adam Vogt worked closely with SCCTC welding instructor Ray Ingoglio (not pictured) on the specs for the plunger lift training unit. 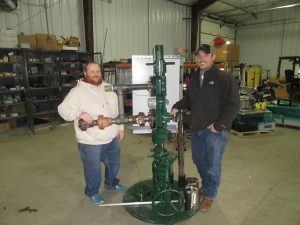 As Cabot Oil and Gas develops new technology to further increase productivity of its wells, the close relationship with the Susquehanna County Career and Technology Center (SCCTC) at Elk Lake High School has resulted once again in a solution to the company’s need for a complex training tool – this time for its employees. As the pressure in older wells decreases, it becomes more difficult to force excess water to the surface. As the fluids build up, gas production is adversely affected. The traditional remedy has been to halt production once per day or so and inject detergents to create suds to bring the fluids back up, Cabot production foreman Ryan Bennett explained, but it is inefficient. Another way to handle the fluid buildup is with a device called a “plunger lift,” which is dropped to the bottom of the tubing in the well, where it makes contact with a spring. The pressure in the well casing increases until the plunger rises to the top, bringing the fluids with it. “Once installed, the unit runs continuously, and all you have to do is set the parameters through the application to manage the device,” Bennett offered. The plunger lift is universal in that it is implementable on most existing wells pads, but the productivity of the wells can vary depending on various stages of production, which influences when a company might install them. Therefore, a mock-up of the plunger lift unit was needed to help Cabot employees see the workings from the inside out. Cabot SCADA/measurement foreman Adam Vogt made a call to SCCTC welding instructor Ray Ingaglio, who has overseen the fabrication of other instructional tools on Cabot’s behalf for use at the Lackawanna College School of Petroleum and Natural Gas. Bennett followed up with an email providing the details of what Cabot needed. “About a half dozen students worked on it,” said Ingaglio. Tasks included cutting a base (below) for the unit, dissecting the valve, and assembling and disassembling it until all the parts were functional. 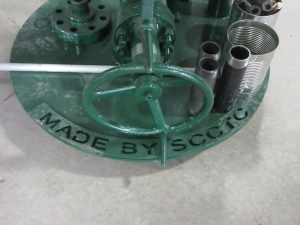 The project provided opportunities for the students to try a number of processes that were new to them, including developing a program to cut out the base embossed with the letters SCCTC with a computer-controlled plasma cutter. At Cabot’s end, the SCADA team was busy building the companion piece, an RTU (remote terminal unit) that can be specifically configured with the HMI (human interface machine) on each well pad. “The rest of it is a series of control modules and relays that actuate automated valves to let the plunger drop and pull the plunger up,” Vogt explained. While they have collaborated on a number of initiatives, Vogt suggested that the plunger lift training unit may be the most complicated and significant project to date on which SCCTC has taken the lead. Cabot will realize a substantial savings in time once the artificial lifts are in operation. According to Cabot external affairs coordinator Bill deRosiers, increasing the company’s efficiency in the field will help it achieve an increase in production from two to three billion cubic feet (BCF) per day, the projected volume of natural gas needed by next year to fill the Atlantic Sunrise Pipeline and two new power plants; the Lackawanna Energy Center at Jessup and the Moxie Freedom Power Generation facility in Benton. In the meantime, the recent project is indicative of a relationship with a relatively rural school district that provides SCCTC with materials, funding and connections that many larger schools cannot offer. Among the trade-offs is a growing, professionally-trained, homegrown workforce.